This set contains 5 colors: Orange, Yellow, Yellow Green, Sky Blue, and Pink. Unique highlighters are reinforced with Polyacetal plastic for heavy-duty highlighting and use. Polyacetal is known for its stiffness, strength, resilience, low frictional wear, and high structural stability. These double-sided highlighters feature a fine point highlighter marker on one end and a broad highlighter marker on the other. Contains pigment ink for long-lasting color. The highlighters are refillable and are available in a wide range of colors. The ink is not acid-free. 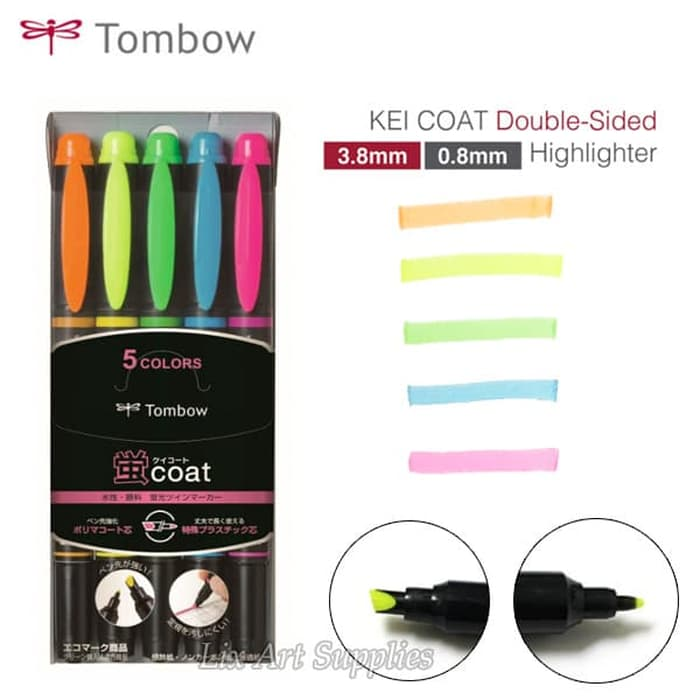 Kei Coat highlighters may also be known as Kay Coat highlighters.